So one huge determining factor as to whether or not you become a consistent ball striker will be where you position the ball in your stance and how consistently you get the ball positioned where it needs to be for each club. 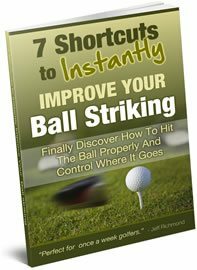 If your ball is positioned poorly then you’ll need to make a lot of compensations as you swing and this will mean you’ll greatly lack consistency. So here’s where you need to position the ball in your stance to become a consistent ball striker. For your Driver and 3 Wood your ball should be positioned directly off your left foot instep. Then for your 2-iron through to 6-iron your ball should be positioned a ball width inside your left instep. Important Note: If you’re using high lofted woods or hybrids then here is what I suggest. Anything up to 19 degrees in loft, e.g. a 5 wood should, use the driver ball position. Woods/Hybrids over that, e.g.a 21 degree 7 wood, should use the 2nd ball position that I suggest for 2 – 6 irons. Finally for your 7-iron through to 9-iron your ball should be positioned two ball widths inside your left instep. After seeing this you may be wondering why three ball positions are recommended when it would be so much easier to have just one ball position. When you swing a driver you need a more sweeping motion than you do with say a 5-iron. And if you had just one ball position for both of these clubs then you would have to adjust your swing consciously to produce the correct swing motion (i.e. a sweeping one for a driver and a more downward blow with a 5-iron) and that’s not good. 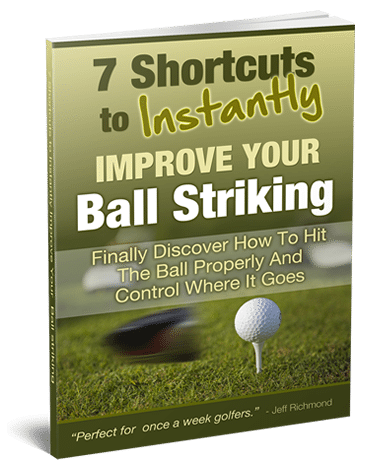 So work hard on getting the ball positioned correctly and consistently for each club you’re using and you’ll give yourself a great chance of becoming a consistent ball striker.